When people start their own business, usually the last thing they think about is how they’re going to manage their books. While there are many accounting solutions out there, the majority are confusing and difficult to use, which results in bad bookkeeping and frustration for business owners who just want to run their business. We spoke with Allan Branch, Co-Founder of LessAccounting, about the problems facing business owners when it comes to their bookkeeping, why he thinks QuickBooks isn’t good for small businesses, and how LessAccounting is making life easier for its customers. How was LessAccounting founded and what was the impetus for doing so? My business partner, Steven Bristol, and I started working on the code base before we officially created the company. He was a contractor for me, and I’m the designer, and we worked together on client projects. We both felt this need to help educate business owners on bookkeeping. It’s one of those things that you have to do as a business owner. For example, I’m a designer, I like to design; and I thought, “Hey, I’ll create a design business.” But I don’t like bookkeeping–I didn’t even know what bookkeeping was at the time. It was just one of those things that got in my way, none of the software was any good, and I couldn’t figure it out. So as we got into it more and learned about it, we decided to create an accounting package or a bookkeeping package that would help businesses keep their books in order. So what was the most difficult part about building the product? To build a bookkeeping application, even to this day it’s a battle to fight back the urge to add lots and lots and lots of features, because every business is different. They have different bookkeeping needs and different workflows, and you’re constantly battling to keep the product simple and easy to use and still maintain features that can reach a large amount of businesses. We’re always fighting back the urge to add an additional feature–that’s the hardest part of building an accounting app. With a to-do list or some other applications it’s pretty straight forward. With accounting packages, you’re coming with a lot of baggage. 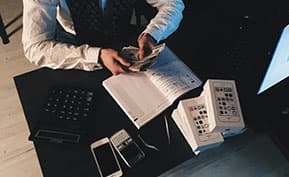 These users have been using QuickBooks for years and years, and they have this preconceived notion of what accounting and bookkeeping actually is when QuickBooks has made it terrible for them. Or you have users come over that have never done any bookkeeping and they have no idea of the terminology, and so you have to educate them. From fighting the battle of keeping features simple, educating new users, and then kind of un-teaching users who have these preconceived notions of what bookkeeping is and showing them how easy and simple it actually can be. What do you think is the biggest problem that you see your customers facing because of all these different ideas of what accounting should be or what bookkeeping should be? People are either doing too little bookkeeping or too much. We have users who have kept every single receipt for the past 20 years, nine different bank accounts, and they’re just doing too much. It doesn’t have to be that hard. Or they have no bookkeeping because they have no idea what to do and they’ve created a humongous mess. Then you’re having to teach them what bookkeeping is. Most people aren’t doing the right amount. For example, they think they have to prepare their own taxes–we’re big believers in hiring a tax preparer. So our customers are either trying to do everything themselves, or they’re doing nothing at all and they haven’t filed taxes in years. Going back to what you were saying about trying to keep the solution simple: when customers approach you and say, “I would really like to have this feature,” what do you tell them when the whole idea is to keep LessAccounting as streamlined as possible? We empathize with them that they’re feeling distraught and frustrated in that moment. We really manage support, and we’re really good at crafting responses that are very genuine, not robotic, not too “professional.” We want to empathize with the person and that they’re dealing with a problem that they can’t solve, but we can help them solve. We might want to give them everything they want, but it’s not always in our best interest to build that feature. So a lot times they’ll think they need a feature when in reality that’s not a bookkeeping task, that’s a tax preparation task or an accounting task or something that they can use another feature in a similar way to accomplish the same thing. Most of the time when we have feature requests, it’s not really for a feature request; it’s just that they don’t understand what to do, or they’re doing too much in the books, and they’re one of those people that think they have to be doing more than they really need to be doing. I saw the comparison chart that LessAccounting has for your different competitors, and I thought it was really interesting because not many companies are that frank about what they think of their competitors. Those are the ones that people ask us about, and they ask how do our features compare to these applications. There are some great applications out there, and we don’t have to have every user. In reality, we provide great, great support; but we don’t want to trick a person to using our app when they’re better off using someone else’s app because it’s going to cost us money. We’d end up getting them on the site, they’d pay us $30, and we’d spend $100 with them talking to our support team and being frustrated with the application. When they’re not the right fit for us, it’s really not in our best interest to get the wrong people signed up. We want people that are really a good fit for our application who be really happy. I don’t want upset users; I don’t want users that just think the app is okay. I want only users that love the app. So we will find those people. It’s in our best interest to not try to do smoke and mirrors and not try to trick people, but to be honest. There’s a bunch of them. You have Wave Accounting, inDinero, there’s a lot with invoicing apps; I mean, there’s hundreds of those. But those are about the only full-fledged accounting apps that are more than just a guy in his garage, off the top of my head. There’s Zoho, and they have an accounting package, I believe. The main ones that are listed, the ones on our website, those are probably 19 times out of 20 the ones that people ask us about. What is the ideal type of customer for LessAccounting, since you were mentioning how you don’t want to trick the wrong sort of customer into using the app? 99.9% of the transactions our customers do are all dealt with through electronic payments, PayPal, bank wiring, things like that. I don’t want to deal with any business that does a lot of cash payments or having to save a lot of receipts. I think receipts are kind of this dying trend. Our average user has less than five million dollars a year in revenue. Remote teams seem to work really well, also. There’s lots of cloud apps, but maybe that’s become a trend with cloud apps and having remote teams. At the same time, there’s no real typical user. If a grocery store or a company with inventory came to me, I’d probably tell them that they want to use some other application. Stores that have POS systems I don’t think are a good fit for us. People that need to have depreciation with inventory are not a good fit for us. They’re better off using Xero or QuickBooks. So, besides your own solution, what other kinds of software do you guys use that you think is pretty great? We use Campfire for chats. We have a Campfire room for each one of our projects, and for Steve and I. We use Skype for video chatting. We use DropBox, Google Documents, SurePayroll for our payroll stuff, SnapEngage for our chat room between our customers and our team. We just switched help to FreshDesk for our support tickets, I believe. We use Optimizely for AB testing, Kiss Metrics, Kiss Insights, Pop Surveys, Grasshopper.com. I think that’s about it. I know LessEverything works on a different kinds of projects, so where do you see your company headed in the next five years? Are you working on something new that’s coming out, or are you just concentrating on your current projects? We are a bootstrap company; we’ve never taken any funding and we’re highly profitable. So we’re not in some sort of race to release or to sell out or exit or IPO. We’re not in some big rush. We’re going to be here in five years, we’re going to be here in ten years, unless the whole Internet collapses and we all go to caves or something. We’re all involved in LessAccounting. We’re about to release a whole new version that’s completely redesigned and redeveloped. We started from scratch with a new app with a bunch of new features, workflows, and accounting collaboration for a business owner and accountant. Like I said, we think the future of accounting software is that most of it is becoming automated, and the rest of it should be collaboration between a business owner and an accountant, or the business owner and the tax preparer. Budgeting is going to start to become bigger, as well as cash flow projections and analysis. At the end of the day, we want to help people run their business better and give them software that helps them stay ahead in their books and collaborate with their accountants and tax preparers. My final question then is what makes you the most excited about what LessAccounting is doing? Let me just say that I didn’t grow dreaming to build accounting software. But I love helping people, and that sounds really cheesy, but I really do. I think it’s fun to be able to talk to a business owner and hear them say our software saved them a whole bunch of time. That, to me, is kind of cool. We have freelancers that work part time that are using LessAccounting all the way up to IHOP chains and car washes and restaurants and things like that. It’s interesting seeing the users of LessAccounting trying to take the product and have their own ownership role and say nice things about it. Most people in our industry who are building web apps in general are in this super fast paced mode, sort of killing themselves, and that’s not who we are or what we do. We’re not really building a company like a lot of other people are building companies. We’re building a company that will last, not building a company that goes IPO or makes a big exit. Every day is something new. Every day I’m working on something different, and so that’s fun, too. I think my employees are happy, they’ve been around for years, and it’s nice being around people who are happy. I’m excited about working with the people that I’m around every day. Looking for more information on accounting software? Check out our side-by-side comparison of leading platforms in the Top 15 Accounting Software report. You can also browse exclusive Business-Software.com resources on accounting and financial management by visiting the accounting research center page.